Chances are, you’ve heard that quinoa is the trendiest new superfood in town. It’s loaded with fiber, it has plenty of iron, and it has all of the essential amino acids. Not only that, it’s a seed, not a grain — making it a healthy alternative for celiacs or those simply wanting to ditch glutenous grains like wheat, barley and rye. And it doesn’t taste half bad, either. But while quinoa is a relatively new food on American plates, it’s been an integral part of several South American cultures for centuries. Sure, they eat the stuff just like we do… but they also put it on their face! And other parts of the body! Weird, right? Well, not that weird, as it happens. Many of the qualities that make quinoa such a nourishing and versatile food also make it an excellent natural skincare ingredient. Here are some of key reasons why quinoa makes a great face wash (and general skincare product), and how to make the transition from your plate to your face! Just like you’ve probably already jumped on the quinoa bandwagon, you’ve likely also caught wind that collagen is a critical element of healthy skin. Healthy collagen concentrations in the skin are associated with elasticity and firmness, while declining collagen is directly linked to wrinkles and saggy skin. And considering our collagen production declines steadily as we age, it’s no great surprise that the collagen supplement and skincare industry is booming. But while most of these fancy schmancy products may have impressive names and bold claims, they rarely deliver. So: more quinoa means more collagen and subsequently smoother, firmer skin. Not bad, right? Similar it’s matrix metalloproteinase-blocking ability, quinoa has also been shown to block another enzyme called tyrosinase — which is known to cause skin pigmentation. And the same study that demonstrated the pro-collagen potential of quinoa also indicated that topical application of quinoa was able to significantly lower the pigmentation-promoting action of tyrosinase. This means that simply rubbing quinoa onto your skin can reduce unsightly brown spots or brighten skin suffering from hyper-pigmentation. It’ll also even out healthier skin tones, giving your complexion a welcome boost! The skintastic benefits of quinoa don’t stop there. Physically, quinoa is abrasive enough that, when rubbed over the skin, it can remove dead skin cells that tend to clog pores and lead to acne and other skin problems. On the other hand, quinoa is still a relatively soft seed, meaning it won’t damage the skin’s protective outer barrier – the same can’t be said for other, specifically formulated exfoliant products! So is it as simple as shoving your hand in a packet of quinoa and rubbing the stuff all over your face? Not quite, but it’s still pretty darn simple! Here’s how to make an easy, nourishing face wash and exfoliator with quinoa and a few other common ingredients. To cook the quinoa, simply place it in a pan with two cups of water and simmer for 10 to 15 minutes, until tender and the liquid has mostly absorbed. Next, place the cooked quinoa in a bowl and pour in the olive oil. You don’t need to be too careful with how much you pour in – the consistency of your quinoa face wash is up to you! Mix the quinoa and olive oil around until it’s formed a thickish paste, then gently massage it onto your face. Rinse with warm water, and repeat once every two or three days (any more often and you could risk drying out your skin). And if you really want to make the most of those wonderful skin-promoting compounds in your quinoa, consider following up with a natural, toxin-free moisturizer that contains decent amounts of quinoa. Next articleCan Acupuncture Really Mend A Broken Heart Faster? Hey Buddy!, I found this information for you: "How To Wash Your Face With Quinoa (And Why You Should)". 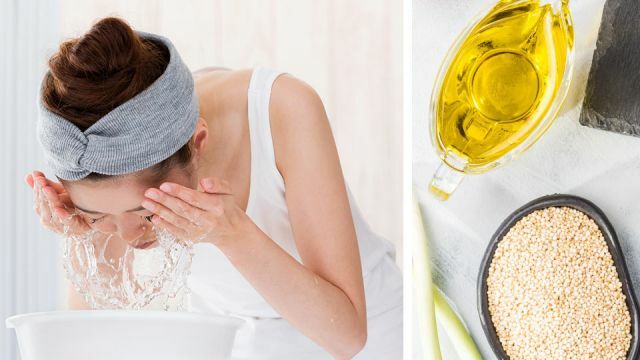 Here is the website link: https://www.thealternativedaily.com/how-to-wash-your-face-with-quinoa-and-why-you-should/. Thank you.